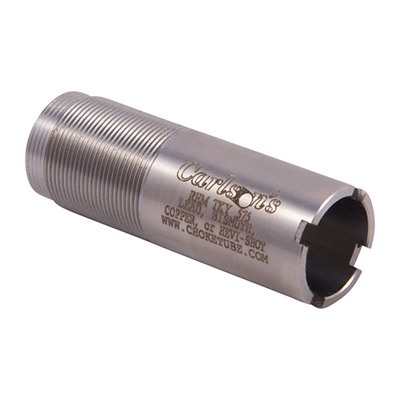 Flush mount, stainless steel tubes available for the many shotguns using the popular Win-Choke thread size and standard Remington. These tubes can be used with magnum and steel shot loads. Tru-Choke Thinwall tubes are recommended for 2 3/4" Lead Shot loads ONLY. All X-Full and Turkey constrictions are for use with Lead and Hevi-Shot ONLY! View Carlson's Choke Tube Interchange List Mfg: Carlsons SPECS: 1704 Stainless steel, heat treated. Available for 12 and 20 gauge, depending on model. RemChoke-style: .814"-32 tpi (12 ga.) or .702"-32 (20 ga.) fits barrels originally equipped with RemChoke factory tubes.